You can also watch our video interview with Figalli or listen to it as a podcast. 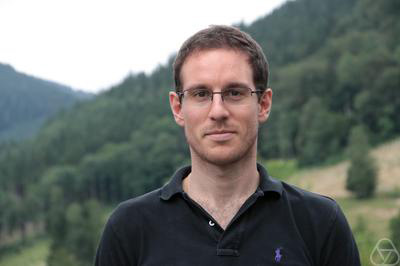 Alessio Figalli has been awarded the Fields medal for "his contributions to the theory of optimal transport and his applications in partial differential equations, metric geometry and probability". Image: Tatjana Ruf, CC BY-SA 2.0. As the name suggests, optimal transport theory is about finding the best way of moving a distribution of things from one place to another when there's a choice to be made as to how exactly to do this. As an easy example, imagine you own a series of gold mines and want to transport the yield of each mine to a bank for safe deposit. You've got the same number of banks as mines, and your task is to decide which mine to match up with which bank. The optimal way of doing this depends on what you feel is best. If you simply want to minimise the total distance across which gold will be transported, then you need to match each mine to a bank so that the sum of the individual distances from a mine to its bank is as small as possible. But as anyone who owns a satnav will know, the shortest distance is not necessarily the fastest. So if you want to minimise the overall time your gold spends on the road, then you might want to match mines and banks in a different way. Putting this more generally, you have a cost function which tells you the cost (in terms of distance, or time, or something else) associated to each pairing of a mine and a bank . You want to pair banks and mines in such a way that the sum of the cost of all the pairings is as small as possible. Optimal transport problems in some form or other must have occupied people since the dawn of humanity, but they first got a thorough mathematical treatment in the late eighteenth century when the French civil engineer Gaspard Monge considered the question of how to best shift a pile of sand into a hole of equal volume. Monge wasn't thinking of stuff being located at discrete locations, as with our gold mines above, but as distributed continuously over the place, just as sand appears to be. The equation that needs to be minimised in this approach therefore isn't a finite sum, but an integral with respect to specific measures — those familiar with these things can find the exact formulation of Monge's optimal transport equation here. Phrased in this way, the optimal transport problem turns from something we might perhaps be able to solve using pencil and paper into a deep problem in the theory of mathematical functions. In fact, as it stands, Monge's problem cannot always be solved as a suitable optimal transport function simply might not exist. Only a clever reformulation by Leonid Kantorovich in the 1940s made the problem more approachable (although solutions to Kantorovich's problem don't always translate into solutions of Monge's problem). Optimal transportation principles have been used to model the branching of rivers, trees, and the veins within a leaf. This picture of a branching river in South Eastern Australia was taken by the mathematician Peter Markowich, whose mathematical photography we covered in this Plus article. Mathematically there are various directions into which one can go with a general optimal transport problem. For example, one can consider various different cost functions and ask whether an optimal solution exists for such a cost function and how to find it. One can also alter the underlying space: above we assumed that our gold mines and piles of sand existed in ordinary Euclidean space, but what if the mass we want to move around exists in a more exotic geometric space? Once you have an optimal solution, you might also ask yourself what mathematical properties it has: is it nice in some sense (e.g. smooth) or more complicated? But Figalli is also being praised for the way he has applied optimal transport theory to other areas of maths. A particularly interesting application affects something we all deal with every day: the weather or, to be precise, the weather forecast. "To model large-scale atmospheric flows meteorologists use the so-called semi-geostrophic equations," explains Figalli in a video produced by the Simons Foundation (see below). "These equations are used to predict the evolution of clouds." If you think of clouds as infinitesimal particles that move around in space, then understanding how all the particles have moved over a period of time involves solving an optimal transport problem. It's this connection that enabled Figalli and his colleagues to solve the semi-geostrophic equations. "In recent years I have managed to solve several problems I wanted to," says Figalli in the same video. "But still my to-do list is long and I have work for the next twenty or thirty years." We congratulate him on his Fields medal and wish him all the best for his future work. We especially hope that he will soon manage to solve the problem that's more important to him than all others: to finally manage to live in the same town as a very special fellow mathematician, his wife.